There are plenty of great venues for night-time entertainment within the city of Puerto Vallarta, Mexico. However, we’ve chosen to shine a spotlight on the ultra-fabulous night spots which are hip, trendy, glittery and very popular with the young and beautiful clubbing crowd, with an age range of about 18 to 35. Conveniently, the clubs in Centro are located right next to each other along the beachfront Malecon, with Roo just a short walk south from the other clubs. Strana and La Santa are both in the Hotel Zone, but they’re not withing walking distance from one other; you’ll need to take a cab. Most clubs offer various specials throughout the week, and these continuously change. At various times some of the nightclubs may offer wristbands that include entrance along with an open bar, and these often range in price from $350 – $500 pesos or more. Remember to factor in tipping, as tips are not included. During weekdays many of the clubs along the Malecon do not implement a cover charge, but on weekends and holidays there may be a cover charge. Women are often offered free entrance not only on Ladies’ Nights but also early in the evening (often before 11 p.m.), or during slow periods when the nightclubs want to start populating their establishments to get the party going. On some nights there will be clubs throwing foam parties, while others throw pretty awesome-looking swim parties. Check their FB pages for more info. Operational Hours: 10 p.m. – 6 a.m. In addition to on-street parking, Strana has a small parking lot and offers valet parking service. Reservations accepted. Walk-ins welcome. Strana offers waiter service. Clubbers: Dress to impress! For summer 2014, they’ll be throwing several daytime pool parties through mid-July. La Santa nightclub in the Hotel Zone of Puerto Vallarta, Mexico. In an elegant and brand-new facility (spring 2014), La Santa is one of the hippest and trendiest night clubs in Puerto Vallarta. There is a swimming pool with a sliding overhead dome in one area, and a large club with dance floor in another area. La Santa throws fabulous pool parties on various days throughout the spring and summer for its local and international party crowd. Since its opening in December 2007, Mandala nightclub is a popular destination for both locals and international visitors alike. Open every day of the week, Mandala is a wonderful venue for dinner and drinks before its environment transforms into a hot night spot after 10:30 p.m. The energy of their dance and party scene starts heating up and continuously gains momentum after 11 p.m. into the early a.m hours. Clubbing attire ranges from classy casual to dressy. Punto V nightclub along the Malecon in Puerto Vallarta, Mexico. Punto V is beautifully situated in the heart of Puerto Vallarta, right along the PV Malecon. An exquisite restaurant by day, after 11 p.m. Punto V turns up the volume and becomes a flashy and trendy hotspot for music, dancing, social drinking and partying. The place bursts with energy and draws in a lively crowd ready to have good time. Operational Hours: 4 p.m. – 6 a.m.
Ladies’ Night: Thursdays 11 p.m. until 3 a.m. – Ladies can drink whatever they’d like and all they want for FREE! Zoo Foam Parties are held every Tuesday: During the foam parties they offer clubbers “Open Bar International” for $450 pesos. Otherwise, without open bar, the cover charge is their standard $100 pesos. Zoo is one of the most popular nightclubs along the Malecon strip with it’s fun and exotic theme and environment. The exciting clubbing atmosphere starts at 11 p.m. or closer to midnight. Operational Hours: 7 p.m. – 6 a.m.
La Vaquita nightclub on the Malecon in Puerto Vallarta, Mexico. The dress code at La Vaquita ranges from casual attire to dressy casual ensembles. Operational Hours: Monday – Friday, 4 p.m. – 4 a.m. / Saturday & Sunday, 4 p.m. – 6 a.m.
Hilo nightclub is located along the Malecon in Puerto Vallarta, Mexico. Hilo’s dress code is casual to dressy casual. Hilo offers valet parking services. Operational Hours: 9 p.m. – 6 a.m.
Ladies’ Night: The days on which Ladies’ Night is offered are continuously rotating. Check their FB page for current info. 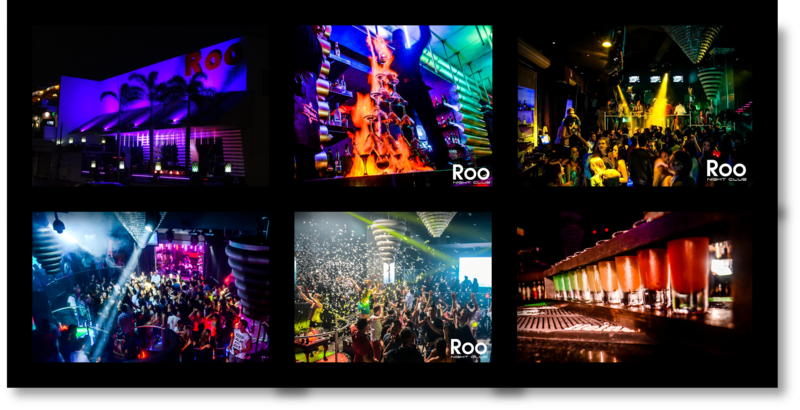 Roo Nightclub located across the street from the PV Malecon in Puerto Vallarta, Mexico. WORDS OF ADVICE FOR THE COLLEGE CROWD: Do keep track of your drinking tab and know in advance what each drink costs, as $8 – $10 per drink can really add up fast. It’s recommended to close out your drinking tab after every two rounds so that you can better keep track of your finances and the tab, and ensure no mistakes were made such as accidental extra charges ending up on your tab for drinks not ordered or served. Make sure to retain enough money to pay for a taxi back to your hotel or condo at the end of the night. As you would anywhere, don’t put down your drink to dance and then return and drink from the glass; this most especially applies to young women. Under no circumstances should you purchase drugs from anyone. Mexico has a zero-tolerance policy for this type of activity for locals and tourists; if caught with drugs you will most definitely end up in jail. It’s strongly advised that young clubbers select a member of their friend group to remain sober each evening (be fair and rotate this duty) to watch out for each other and to make sure that clear-headed decisions are made. It’s advisable that women use wristlet-type purses that remain attached to the arm as any purse, camera or phone that is carried in your hand will eventually be laid down at a table, booth, in the bathroom or with a forgetful friend and can very easily be stolen by other clubbers or inadvertently left behind, especially if you get bit tipsy and your attention drifts. Always employ good common sense when clubbing anywhere. Have fun!